Heat the oil in a pan. and then put garlic and chili to stir around 10 sec. and then put minced pork to stir around 30 sec. And then put stock powder, soy sauce, sugar, fish sauce and water . Stir it to combine. Put the basil leave and stir it. 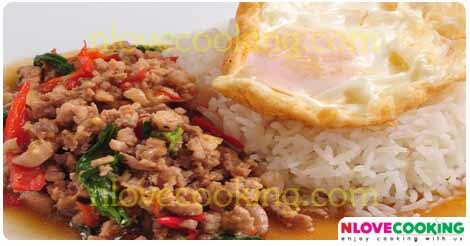 Serve Basil Fried Minced pork with a jasmine rice.